The two features that many think of when you think of Roman Britain is Roman roads and Roman walls. The Romans had within their legions excellent stonemasons. These were able to put stone blocks to fit so tight that hardly any mortar was required and to shape stone for bridges, arches, aqueducts and more. They constructed walled forts, built town walls and a number of walls to keep out, in or control the flow of people. We have a number of surviving town walls and many fragments. 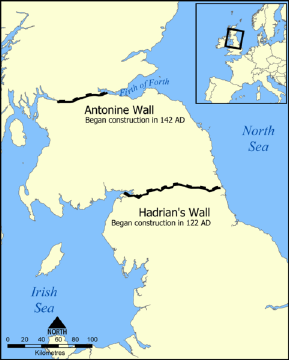 Some of the walls they built within the empire were very long, and in Britain there were a number of walls built to control the flow of people, of these Hadrian's Wall and Antonine Wall are the best known. Hadrian's Wall was 80 Roman miles (73.5 statute miles or 117 kilometres) long, its width and height dependent on the construction materials which were available nearby. East of River Irthing the wall was made from squared stone and measured 3 metres (9.7ft) wide and 5-6 metres (16–20ft) high, while west of the river the wall was made from turf and measured 6 metres (20ft) wide and 3.5 metres (11.5ft) high. This does not include the wall's ditches, berms, and forts. The central section measured eight Roman feet wide (7.8ft or 2.4m) on a 10-foot (3.0m) base. Some parts of this section of the wall survive to a height of 10 feet (3.0m). The initial design had small mile forts and turrets between. Later it was decided to add 14 or 17 larger forts along the wall length, each holding 500 to 1000 auxiliary troops. In the years after Hadrian's death in 138, the new emperor, Antoninus Pius essentially abandoned the wall, leaving it occupied in a support role, and began building a new wall in Scotland proper, about 160 kilometres (100 miles) north, called the Antonine Wall. 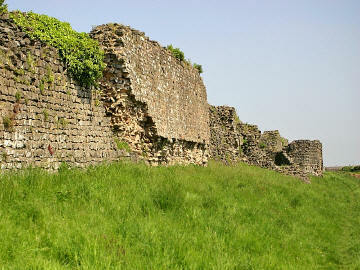 This turf wall ran 40 Roman miles (about 37.8 miles (60.8km)) and had significantly more forts than Hadrian's Wall. Antoninus was unable to conquer the northern tribes, so when Marcus Aurelius became emperor he abandoned the Antonine Wall and reoccupied Hadrian's Wall as the main defensive barrier in 164. The wall remained occupied by Roman troops until their withdrawal from Britain. The Hadrian’s Wall Path is a long distance footpath in the North of England, which became the 15th National Trail in 2003. It runs for 84 miles (134.5 kilometres), from Wallsend on the east coast of Great Britain to Bowness-on-Solway on the west coast. The path runs through urban areas, and over moors. For most of its length it is close to the remains of Hadrian's Wall. which we hope to have available shortly.